AWC is just beginning, but we're already planning our closing festivities! What better way to celebrate Arena of Valor on a global scale than after the conclusion of our biggest esports event? On "Swag Sunday," July 29th, login and play one match to unlock a DC hero of your choice or the Catacombs Arthur skin - available for the first time since global launch! 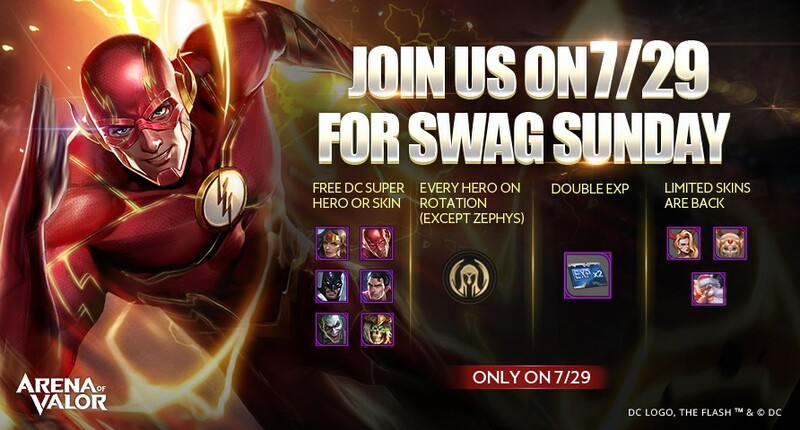 1) Login on Swag Sunday, 7/29 and play one match to unlock your choice of: Batman, Superman, Wonder Woman, The Flash, The Joker OR Arthur's Catacombs skin. 2) Every Hero (excluding Zephys) will be in the free hero rotation. 3) Double XP for all Casual and Ranked 5v5 matches. 4) Fennik, Natalya, and Ormarr's Snow Festival skins return to the Shop. 5) The Mystery Shop returns! Unlock a BIG discount on select heroes and skins. All of these great rewards are available only on Swag Sunday, July 29. Don't miss it!